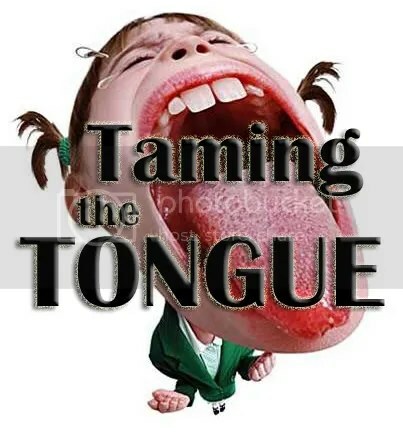 As I mentioned here, I’m preaching on the topic of Taming the Tongue based on James 3:1-12 this Sunday at Lake Merced. Here are a few Scriptures I noted as I read through the book of Proverbs this morning. Most deal directly with speech, but I also picked a few out that deal with responding wisely to rebuke (since a truly tamed tongue will sometimes be forced to rebuke others as I mentioned in the first post ). 7 The fear of the LORD is the beginning of knowledge, but fools despise wisdom and discipline. 3 then do this, my son, to free yourself, since you have fallen into your neighbor’s hands: Go and humble yourself; press your plea with your neighbor! 4 Allow no sleep to your eyes, no slumber to your eyelids. 5 Free yourself, like a gazelle from the hand of the hunter, like a bird from the snare of the fowler. 4 “To you, O men, I call out; I raise my voice to all mankind. 5 You who are simple, gain prudence; you who are foolish, gain understanding. 6 Listen, for I have worthy things to say; I open my lips to speak what is right. 7 My mouth speaks what is true, for my lips detest wickedness. 8 All the words of my mouth are just; none of them is crooked or perverse. 9 To the discerning all of them are right; they are faultless to those who have knowledge. 7 “Whoever corrects a mocker invites insult; whoever rebukes a wicked man incurs abuse. 8 Do not rebuke a mocker or he will hate you; rebuke a wise man and he will love you. 9 Instruct a wise man and he will be wiser still; teach a righteous man and he will add to his learning. 20 The tongue of the righteous is choice silver, but the heart of the wicked is of little value. 21 The lips of the righteous nourish many, but fools die for lack of judgment. 9 With his mouth the godless destroys his neighbor, but through knowledge the righteous escape. 12 A man who lacks judgment derides his neighbor, but a man of understanding holds his tongue. 13 A gossip betrays a confidence, but a trustworthy man keeps a secret. 1 A wise son heeds his father’s instruction, but a mocker does not listen to rebuke. 3 He who guards his lips guards his life, but he who speaks rashly will come to ruin. 10 Pride only breeds quarrels, but wisdom is found in those who take advice. 13 He who scorns instruction will pay for it, but he who respects a command is rewarded. 14 The teaching of the wise is a fountain of life, turning a man from the snares of death. 18 He who ignores discipline comes to poverty and shame, but whoever heeds correction is honored. 20 He who walks with the wise grows wise, but a companion of fools suffers harm. 3 A fool’s talk brings a rod to his back, but the lips of the wise protect them. 7 Stay away from a foolish man, for you will not find knowledge on his lips. 1 A gentle answer turns away wrath, but a harsh word stirs up anger. 2 The tongue of the wise commends knowledge, but the mouth of the fool gushes folly. 4 The tongue that brings healing is a tree of life, but a deceitful tongue crushes the spirit. 10 Stern discipline awaits him who leaves the path; he who hates correction will die. 12 A mocker resents correction; he will not consult the wise. 31 He who listens to a life-giving rebuke will be at home among the wise. 32 He who ignores discipline despises himself, but whoever heeds correction gains understanding. 23 A wise man’s heart guides his mouth, and his lips promote instruction. 27 A scoundrel plots evil, and his speech is like a scorching fire. 28 A perverse man stirs up dissension, and a gossip separates close friends. 4 A wicked man listens to evil lips; a liar pays attention to a malicious tongue. 27 A man of knowledge uses words with restraint, and a man of understanding is even-tempered. 28 Even a fool is thought wise if he keeps silent, and discerning if he holds his tongue. 2 A fool finds no pleasure in understanding but delights in airing his own opinions. 6 A fool’s lips bring him strife, and his mouth invites a beating. 7 A fool’s mouth is his undoing, and his lips are a snare to his soul. 8 The words of a gossip are like choice morsels; they go down to a man’s inmost parts. 20 From the fruit of his mouth a man’s stomach is filled; with the harvest from his lips he is satisfied. 21 The tongue has the power of life and death, and those who love it will eat its fruit. 1 Better a poor man whose walk is blameless than a fool whose lips are perverse. 2 It is not good to have zeal without knowledge, nor to be hasty and miss the way. 16 He who obeys instructions guards his life, but he who is contemptuous of his ways will die. 20 Listen to advice and accept instruction, and in the end you will be wise. 11 When a mocker is punished, the simple gain wisdom; when a wise man is instructed, he gets knowledge. 23 He who guards his mouth and his tongue keeps himself from calamity. 9 Do not speak to a fool, for he will scorn the wisdom of your words. 28 Do not testify against your neighbor without cause, or use your lips to deceive. 11 A word aptly spoken is like apples of gold in settings of silver. 12 Like an earring of gold or an ornament of fine gold is a wise man’s rebuke to a listening ear. 4 Do not answer a fool according to his folly, or you will be like him yourself. 7 Like a lame man’s legs that hang limp is a proverb in the mouth of a fool. 9 Like a thornbush in a drunkard’s hand is a proverb in the mouth of a fool. 22 The words of a gossip are like choice morsels; they go down to a man’s inmost parts. 23 Like a coating of glaze over earthenware are fervent lips with an evil heart. 24 A malicious man disguises himself with his lips, but in his heart he harbors deceit. 25 Though his speech is charming, do not believe him, for seven abominations fill his heart. 28 A lying tongue hates those it hurts, and a flattering mouth works ruin. 13 He who conceals his sins does not prosper, but whoever confesses and renounces them finds mercy. 14 Blessed is the man who always fears the LORD, but he who hardens his heart falls into trouble. 23 He who rebukes a man will in the end gain more favor than he who has a flattering tongue. 1 A man who remains stiff-necked after many rebukes will suddenly be destroyed– without remedy. 20 Do you see a man who speaks in haste? There is more hope for a fool than for him. 10 “Do not slander a servant to his master, or he will curse you, and you will pay for it.